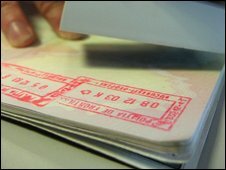 The government has climbed down over plans to make people show passports when travelling between the UK and the Irish Republic. There are currently no passport controls for Irish and UK citizens travelling in the Common Travel Area (CTA) between the two countries. Immigration Minister Phil Woolas had said controls should be in place to tighten security. But the House of Lords voted to remove the clause from a borders bill. The Borders, Citizenship and Immigration Bill transfers 4,500 HM Revenue and Customs officers to the UK Borders Agency and introduces a requirement for immigrants to earn British citizenship. Mr Woolas told MPs at the bill's report stage on Tuesday evening that he was accepting amendments from the Tories and Liberal Democrats to remove the passport clause. He said the government had "listened and compromised" on the bill overall. "However, there can be no compromise on the option of CTA - we either make this necessary change now or we do not," he added. "We are committed to the policy and will examine the options forward but it's clear to me from the discussions that we've had that this clause is not acceptable across the floor of this House and is not acceptable in the other place." A Home Office spokesman said the CTA proposals were important in preventing abuse by "third country nationals" of the UK-Irish border. He said: "By introducing e-Borders to all air and sea routes between these countries, we will be able to check passengers against immigration, crime and terrorism watch-lists and help protect the public from harm. "We still intend to pursue these changes, necessary to enhance the security of our borders, and we will be looking to bring these proposals back to Parliament at the first possible opportunity." Shadow immigration minister Damian Green said he was "delighted" that the clause had been removed. He said: "Conservatives have argued consistently that the Common Travel Area is useful for the United Kingdom, Ireland and the Channel Islands and that the government was wrong in seeking to abolish it." East Antrim MP Sammy Wilson said the scheme would have undermined the rights of people living in Northern Ireland. "In two ways we'd have been treated differently," said the DUP representative. "We'd have been treated as if we were foreign nationals travelling into GB and we would have been treated less well when it came to the security that was available for people in Northern Ireland."